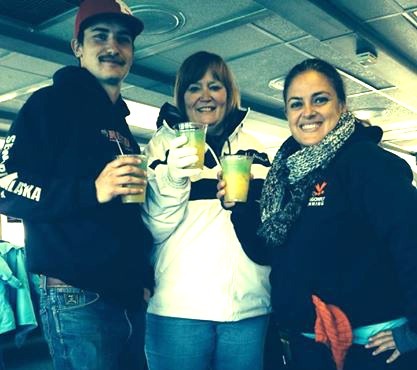 I am loving my time up in Alaska! I am a huge animal lover and I have been blessed to see almost everything on my list (still need an orca). I also love love love beautiful sceneries. Now I do wish they could turn the heat up just a bit, or I need to go shopping for some warmer clothes! This is the first time I was able to wear this cute orange hat though – love it! The first animal we saw was a Humpback Whale!! We would see a couple this day and boy are this guys hard to get pics of! When their tale goes up like this it means that they are diving down and can stay under water for up to 10 minutes. We did get to see one with her calf a little bit later in the day too. Love seeing this big guys in the water! And yes, I would love to swim with them! We saw two different rock areas that were home to a lot of sea lions. They would honk and talk to us as we got closer. Most of these are juveniles or less than 2 years old. Right in the center is the large bull who rules this harem. 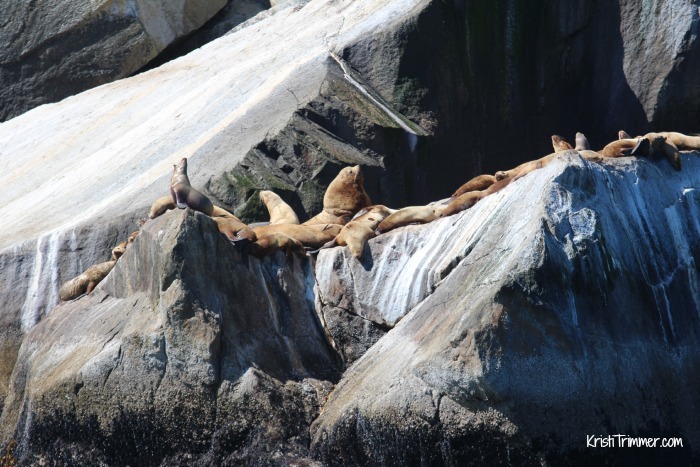 Yep, that’s what it is called – a Sea Lion Harem. Made me laugh too! 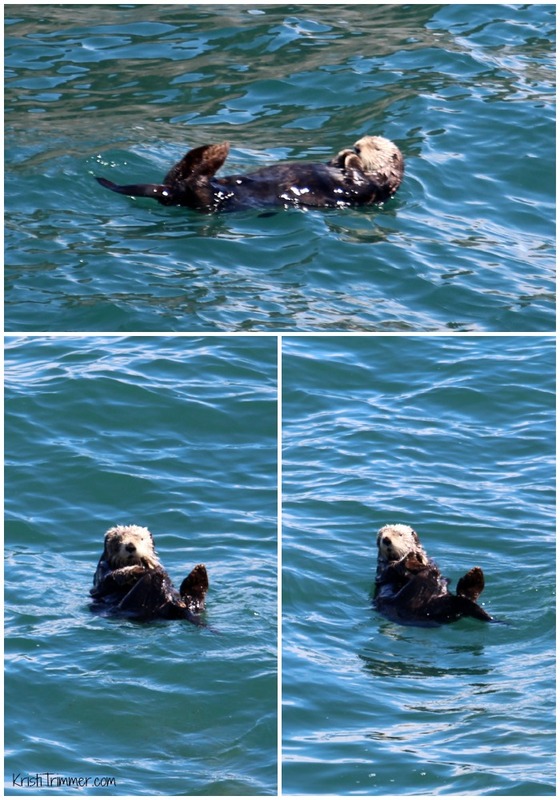 This way too adorable sea otter was just hanging out in the middle of the ocean far away from land or other animals. He was hanging out on his back taking a nap. I did get some great video of him doing some rolling action. A little while later I saw another sea otter doing the same thing. Since these guys mate for life I think they were having a spat and he was told to give her some space! What’s cute about sea otters is that they hold hands when they sleep so not to drift apart from one another. The Alaskan Puffin is only found in Alaska with its bright orange feet. They like to brood in the crevices of rocks – and these rocks were at least a hundred feet tall. They hunt for fish and kind of look like penguins. 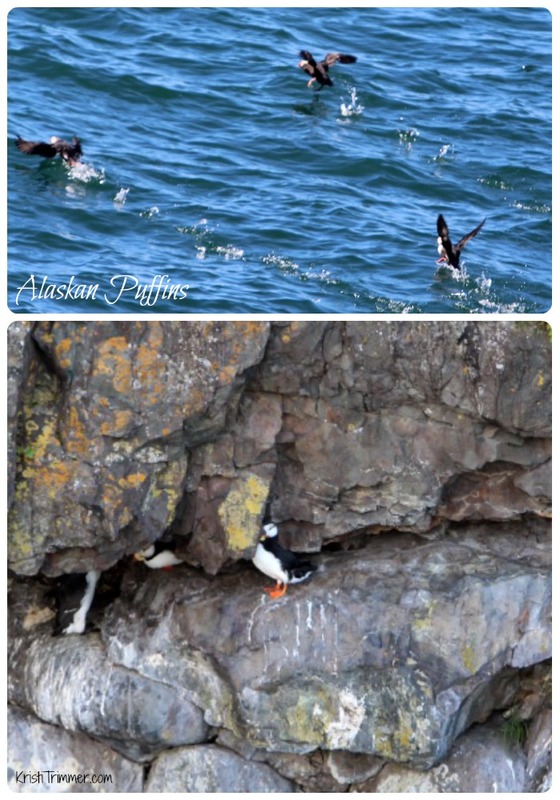 The only other Puffins in the world are in Maine. Who knew? These Dall Porpoises are so crazy fast! 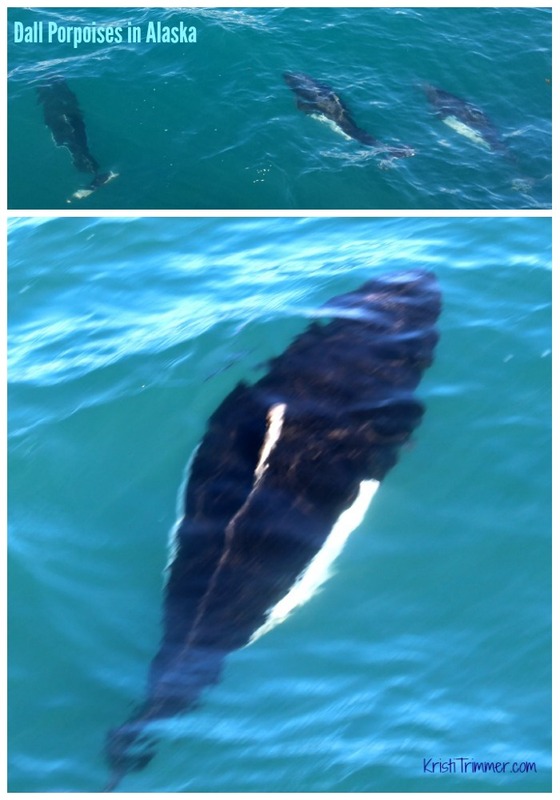 There was a pod of them, about 5-7, that kept racing in front of the boat and leaping out of the water. They moved so fast that it was hard to get a great shot of them. They looked like mini Orcas. I loved watching them race around the boat! As we were coming in from a full day of boating, they grabbed a piece of glacier ice out of the water. Next thing I know it was Glacier Margarita time. There were SO good! They were even better shared with my new friends – Kelby, Rhonda, and Allen Dillon. Kelby lives up in Anchorage and his parents were visiting from the Lower 48… I can’t believe I just said that! It was pretty cool hanging out with this awesome family. Cheers! I have tons more pics of the animals I saw – let me know what you might want to see more of, always happy to share! Thank you Major Marine Tour for one amazingly awesome day. I couldn’t have asked for a better experience. Your Captain, the crew, and the Park Ranger on board were all top notch and informative! I get asked about donating to my travels. Here is my PayPal Donate button if you feel like you want to contribute. Traveling is amazing and I am grateful for the support out here. Without the love and support of my community, and especially my friends and family, none of this would be possible. 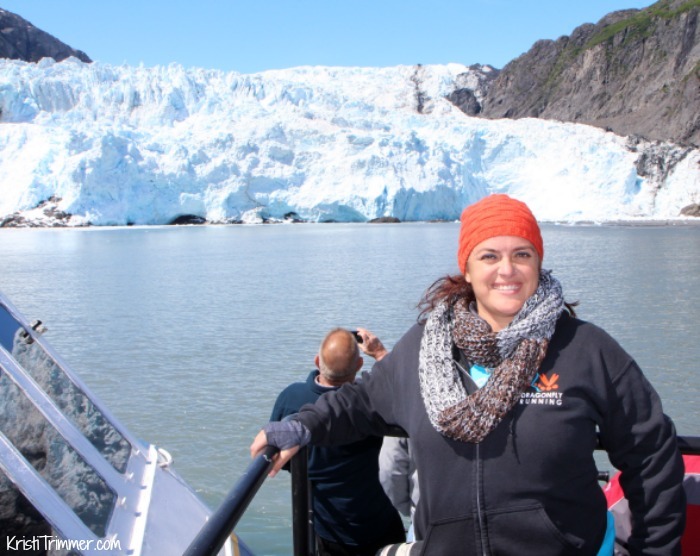 « Alaska Bound: For The Love Of Animals! 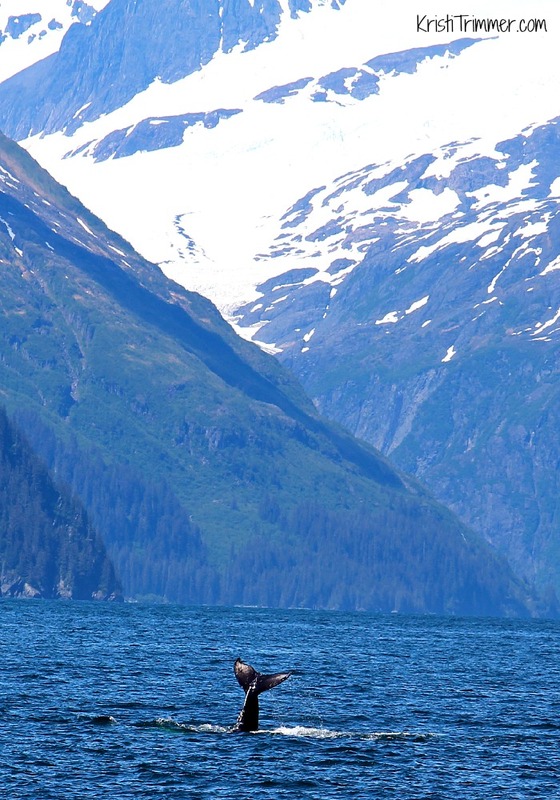 The wildlife in Alaska just cannot be beat. I have a cousin up in Kodiak & someday I’m gonna have to go visit. I would love to visit Alaska! You’re getting to see so much wildlife.